Drivers in the greater Atlanta area have a lot of choices when looking for a new car, truck or SUV. There are hundreds of shopping spots to choose from, ranging from small dealerships to massive superstores. So, if you live anywhere in the metro Atlanta area and have ever wondered “Is there a Buick dealership near me?”, the chances are extremely good that there is one. But, seeing as how there are so many dealerships that sell so many different types of vehicles, why should you choose a Buick dealership near you? If you are indeed looking for a new Buick, and you should be, you should know some of the many benefits of working directly with a Buick dealership. For starters, here at Carl Black Chevy Buick GMC, we have a huge inventory of Buick vehicles. From sedans to SUVs to crossovers, Carl Black in Kennesaw has more Buicks than anyone else around. Those include new models, used models and certified pre-owned models. A certified pre-owned Buick is a used Buick that has passed an exhaustive 172-point inspection. Everything from bumper to bumper, inside and out, must be deemed by Buick and General Motors inspectors as road worthy. This certification comes with a warranty and peace of mind that you are getting a quality car, even if someone else did drive it before you. In order to fully appreciate this vast inventory, you will first need to meet our sales staff. These talented men and women know all about each and every one of the vehicles we have in our lot. If you want to know the fuel economy of a 2019 Buick Encore, we can tell you. If you are curious about the cargo space of a 2019 Buick Enclave, we can answer that. 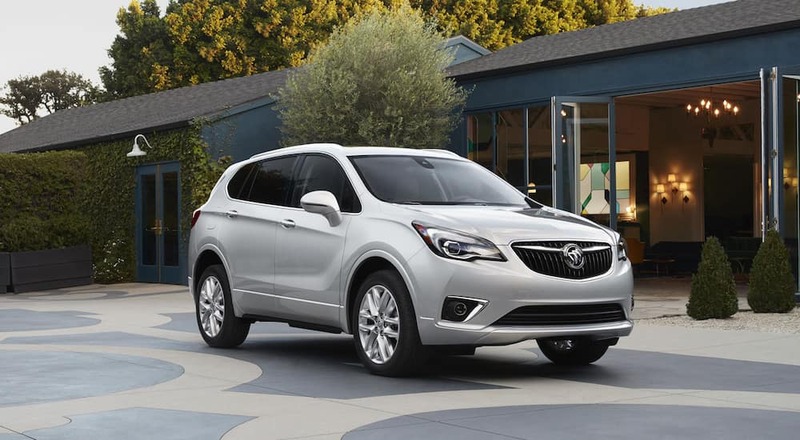 If you want to know about the infotainment features of a 2019 Buick Envision, we can show you. If you want to know why so many Buick models start with the letters “EN”, well… we don’t make those decisions. What we can help you with is finding the perfect Buick vehicle for your driving needs. We sell these awesome automobiles to drivers just like you every day, and we know how different driving needs require different vehicles. We will be happy to put you in just the right Buick for you. Once you have picked out your next Buick, you will next need to meet with our financial team. This is the part of car shopping that is not as much fun, but it is a vital necessity. Not many people can cut a check for a brand new car or SUV. Most people need some sort of financial plan in order to pay for their new car. This is where our financial wizards come in. We can help you set up the perfect payment plan for your budget, including the lease vs. buy option. More and more people nowadays are opting to lease vehicles rather than buy them. There are many reasons why, and we can help you explore if any of those reasons are applicable to your specific situation. We can also assist you with credit checks, loan applications and all that not-so-fun stuff that people dread when car shopping. The good news is that we can also help you discover any specials, rebates and discounts that you may be eligible for. Many people don’t know that if they deal directly with a dealership, they may be able to potentially save thousands of dollars on a new car. We would love to help you out there. We know that purchasing a new vehicle is an important decision, and it is not one that we take lightly. We will take every step with you, in order to make sure that you have made a sound financial decision that you can live with for years to come. When you meet us, you will see the integrity with which we work is one of the many reasons our customers continue their business with us. Once you have picked out your new Buick car or SUV, your last stop before you get to enjoy the Atlanta-area traffic is with our maintenance department. We know that you just made a substantial financial investment, and we want to help you take care of it for as long as possible. Our service technicians can set you up with a maintenance schedule that can help keep your Buick running like new for long after you drive it off our lot. Certain procedures need to be done on a regular basis. Some, such as oil changes and tire rotations, need to be done more frequently. Others, like filter replacements and brake checks, need to be done less frequently. We can set up a schedule that will let you know when these things need to be done. One thing that we will need from you first, though, is a little info on your driving habits. If you spend more time on the highway than you do in city traffic, for example, that may affect how often your oil is changed. If you frequently haul a trailer with your Buick SUV or if you live on a dirt road will also impact your maintenance schedule, as these things will change how your engine reacts to its everyday use. By sticking to this schedule, we will make sure that your Buick is in proper condition long after you have taken it home. Of course, if something does come up, our highly trained technicians can handle any problem you may have, both under the hood and in the interior. We also offer parts for sale, for the more do-it-yourself types out there. We even offer some body work, with decades of experience in collision and even paint repair. At Carl Black Chevrolet Buick GMC in Kennesaw, we pride ourselves on our customer service, from the moment you step foot on our lot to the moment you drive off of it. From our sales staff to our finance team to our maintenance department, our people are what make us thrive in the Atlanta area. People from all over this great city have driven away from us happy and content in their new Buick vehicles. We are proud to be the Buick dealership near you and all of Atlanta. Come down soon and check out our huge inventory. If you can’t make it down right away, our online showroom is open 24 hours a day, 7 days a week. You can view photos and specifications on all of our new, used and certified pre-owned vehicles. You can read customer reviews, pre-apply for financing, schedule a maintenance appointment and much, much more. While it is very easy to spend hours perusing our website, don’t get too caught up in it and forget to come visit us in person. We are located at 1110 Roberts Boulevard in Kennesaw. Our sales hours are 9AM to 9PM Monday through Saturday and 12 noon to 6PM on Sundays. We can’t wait to meet you and get you into a new Buick soon. But you have to come visit us. After all, the one thing you can’t do on our website is test drive a brand new Buick!